[prMac.com] Orem, Utah - Utah based Fiery Ferret is pleased to announce Lumen 2.3, an update to their relaxing puzzle game for iPhone and iPod Touch. A simple to play yet beautiful puzzle game, the objective of Lumen is to light up all the checkpoints on the board by bouncing, coloring, and maneuvering a laser beam through obstacles. Lumen challenges the mind, but can be easily picked up or put down. Gamers can learn to play Lumen through the instructions, or watch a short video in-game. Careful attention to detail and the colorful graphics make Lumen a joy to play. There are no timers or scores and only five different pieces to learn, so it is easy to get started. One of of the greatest things about Lumen is the online puzzle database. Lumen has access to over 2,700 puzzles submitted by other users, so gameplay is virtually unlimited. Gamers can have as much fun creating their own puzzles as solving others. A voting system was recently added that allows users to rate puzzles after completing them, ensuring that the real gems rise to the top. Over 50,000 votes have been cast to refine the puzzle database. Version 2.3 comes packaged with over 150 of the top rated puzzles to play when not connected to the Internet. Lumen also includes an option to show labels on the colored pieces for those who have a hard time distinguishing colors. A handy guide is included for mixing laser colors to make Lumen easier for beginners to pick up. 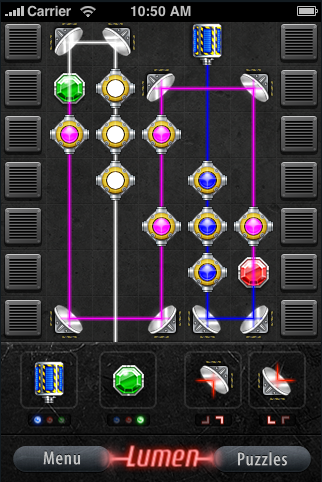 As an interesting detail, Lumen has a hidden cheat which allows a user to reveal the solution to any puzzle. This was the first cheat for an iPhone game. Full instructions are at available online. Lumen 2.3 for iPhone is only $1.99 (USD) and available exclusively through Apple's App Store. New users can try out Lumen Lite, which offers a limited selection of puzzles for free. Located in scenic Orem, Utah, Fiery Ferret is a privately funded company founded in 2007 by Bridger Maxwell. With a focus on quality, Fiery Ferret's mission is developing best-of-breed software for the Mac and iPhone platforms, complemented by first-class customer support. Copyright 2007-2008 Fiery Ferret. All Rights Reserved. Apple, the Apple logo, iPhone and iPod are registered trademarks of Apple Computer in the U.S. and/or other countries.